The remainder of the results in this report reflect the answers of the surveys employed respondents. How do Muslims feel about their work productivity during Ramadan? A majority (77%) of the working professional respondents said they try to maintain the same level of work productivity during Ramadan as they do outside of Ramadan, and feel that work should continue uninterrupted. One key implication of this finding is that people do not expect adjustments to their work hours. This is also highlighted by the earlier response that showed the greatest challenges to having a spiritual Ramadan do not include work flexibility. However, 15% thought work should not be a priority, while a small percentage (3%) answered that nobody works during Ramadan. Meanwhile, 18% of the respondents felt their productivity does drop during Ramadan. This result was consistent in the responses of Muslim majority OIC countries as well as non-OIC markets (US, India, and UK being the largest such respondent countries). What special adjustments do employers make during Ramadan? 49% of the Muslim working professional respondents said their employers set special adjusted Ramadan hours. Other activities included: Iftar gatherings (22%), arrangements for special prayer time facilities (16%), and special Eid gatherings or gift-giving (14%). There is, however, a stark difference between the responses from Muslim majority country respondents (OIC countries – Malaysia, Pakistan, Egypt, Saudia Arabia, and UAE being the largest respondent countries in this case) and non-OIC based respondents (US, India, and UK being the largest such respondent countries). Whereas 76% of the OIC working professionals said employers set special Ramadan hours, only 25% of the respondents from non-OIC countries said the same. Similarly for all other adjustments, the non-OIC responses claimed much less adjustment than those from OIC countries. This is perhaps to be expected. However, this response indicates that non-OIC based HR teams should consider further facilities to accommodate their Muslims employees, using OIC Ramadan practices as benchmark. There was an overwhelming majority of open comments from non-OIC based respondents to this question (164 out of 217 comments). 60% of the respondents said they were satisfied with their employers support during Ramadan, agreeing that their employers go out of their way to provide flexibility during Ramadan. Meanwhile 27% said no, and the remaining respondents had other open-ended comments (summarized below). Similar to the above question, there is a stark difference between the responses from Muslim majority countries (Malaysia, Pakistan, Egypt, Saudi Arabia, and UAE being the largest respondent countries in this case) and non-OIC respondents (US, India, and UK being the largest such respondent countries). 19% of OIC based respondents were unhappy with their employers’ support, whereas this number jumps to 35% for non-OIC based respondents. 74% of the OIC based respondents were happy with their employers’ support during Ramadan. The number dropped to 48% for respondents from non-OIC countries. The fact that 48% of the non-OIC respondents were happy is encouraging. This is a strong indication that non-OIC countries tend to be accommodating to Muslims, although there is much room for improvement. At the same time, OIC based HR groups have opportunities to evaluate employee satisfaction of their own Ramadan support programs. Questions asked: Are you happy with your employer/organizations support and flexibility during Ramadan? What are some of the areas employers can improve upon in their support during Ramadan? 42% of the respondents would like employers to set special Ramadan hours. This request was much stronger among non-OIC based respondents (49% as opposed to 33% from those in OIC countries). Another strong area of request from non-OIC based respondents was for employers to arrange special prayer times or facilities (38%). Given that 77% of respondents earlier said that work should continue uninterrupted, this request of Ramadan work-hour flexibility (not necessarily reduction but adjustment) and prayer facilities signifies a need to help fasting employees deliver consistent work product while satisfying their Ramadan needs. A sizeable number of OIC based respondents (34% and 36%) suggested that employers arrange Iftar gatherings, Eid gatherings and gift-giving as additional employee activities during Ramadan. This expectation was much lower from non-OIC based respondents. 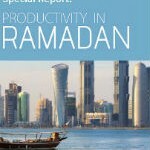 Does a company’s productivity suffer during Ramadan? The majority of respondents (72%) agreed that their company’s productivity does not suffer during Ramadan, and that it is business as usual. As can be expected, this response was stronger from non-OIC based respondents (81% versus 61% from OIC based respondents.) 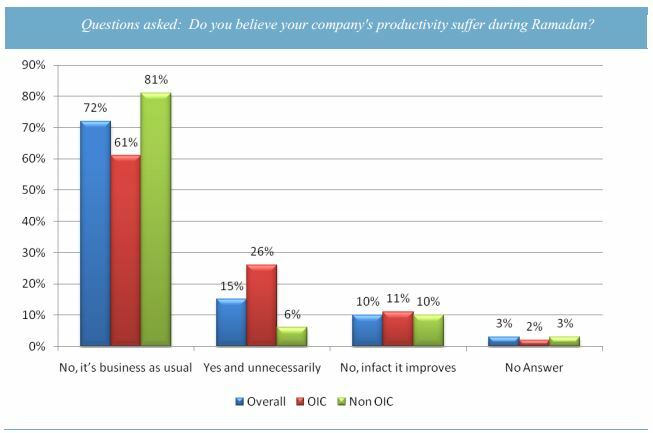 Noteworthy is that 26% of OIC based respondents did think their company’s productivity does unnecessarily suffer during Ramadan. Questions asked: Do you believe your company’s productivity suffer during Ramadan? 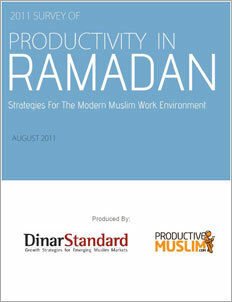 Data Collection: The 2011 Productivity in Ramadan survey was conducted between June 28, 2011 and July 10, 2011, ending before the start of Ramadan 2011. The survey was conducted online in the English language only and marketed to Muslims in five key Muslim-majority countries (Malaysia, Pakistan, Egypt, Saudi Arabia, and UAE) and five countries with sizeable Muslim minorities (USA, UK, India, Canada, and Australia) through ProductiveMuslim Ltd and DinarStandard.com’s network of readers and followers (estimated reach of over 90,000). Scoring: The survey was designed to ensure that respondents could answer all questions as easily as possible. This was done by asking a limited set of questions with most questions being ‘multiple select’ options. In all such questions, and any binary (YES/NO) questions, participants were given the option to select OTHER as an option and provide their open-ended answers. The survey received a total of 1524 valid responses. Valid responses were those with complete demographic information submitted. This response rate represents 99% confidence level with a +/- 4% margin of error. 46% of the responses were from Muslim majority OIC member countries, while 54% of the responses were from non-OIC countries (See Chart). The number of respondents from both OIC and non-OIC countries is fairly evenly distributed and allows us to show differences in spiritual and work experience, productivity, and expectation among these two environments. The Chart below also shows percentage of responses from each country and shows a varied geographic distribution across non-OIC and OIC markets. 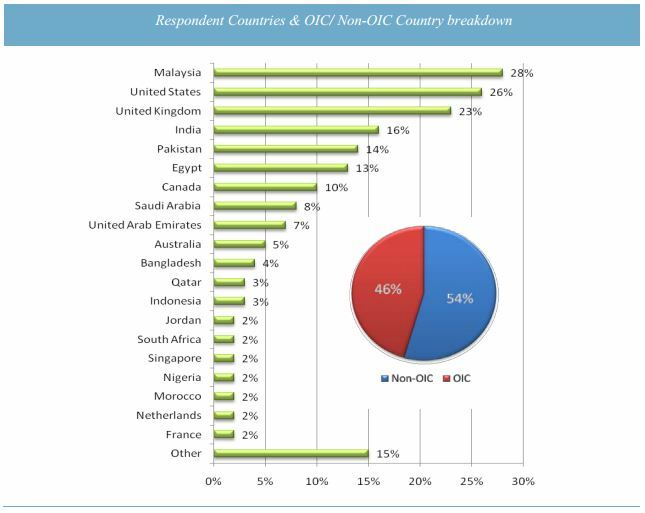 Within OIC member countries, the largest number of responses were from Malaysia (28%), Pakistan (14%), Egypt (13%), Saudi Arabia (8%), and United Arab Emirates (UAE) (7%). Among non-OIC countries, most responses were from United States (USA) (26%), United Kingdom (UK) (23%), India (16%), Canada (10%), and Australia (5%). Given the low number of per country responses, much of the analysis is done at the OIC and non-OIC aggregate country levels. For the purposes of the survey, the sample size and distribution are within acceptable limits and therefore enable us to make valid inferences about the Muslim population. Gender distribution of the survey respondents is 59% female and 41% male. 53% of the responses are from working professionals (any employed person), 38% from students, and 9% are unemployed. 63% of the respondents have completed college (40% graduate, 23% post graduate). The income of 66% of respondents is less than $45,000/year, and 17% earn above $66,000/year. There is a response bias element to the participant profile of this survey. First, an assumption can be made that those who participate and respond to the survey are predisposed to Islam. Second, the survey is reflective of English-speaking Muslims across the world. Finally, the survey presents an employee assessment of work productivity impact and does not take the employer view into account. These factors limit the survey’s ability to truly represent the wide diversity of Muslim views even from the targeted markets. In addition, the survey questions did not offer a scale for potential responses (e.g. 1,2,3,4,5), which would have provided the respondent with some degree of latitude to answer the question in a case where he or she might not be sure of the answer. As a result, the respondent may have, if in doubt, ticked off a selection, though the activity may not be fully carried out by the respondent or the employer. Governments in many OIC countries set the tone for productivity across all institutions within their countries. Our work-hour analysis shows a few different approaches of some OIC countries, which opens the question as to which models are most effective in delivering the right balance of work productivity and employee satisfaction. Although a much detailed analysis of economic impact would have to be undertaken to fully understand the complexities of Ramadan work reduction and adjustment, the economic impact assessment in this study shows that the economies suffer roughly 4% in monthly GDP per hour per day of work reduction. Undoubtedly, no dollar value can be placed on spiritual gains and divine blessings of increased worship during Ramadan, but the fact that there are different approaches to work-hour reduction and adjustment does suggest that governments should evaluate whether their Ramadan policies maintain the right balance of work responsibility and spiritual flexibility during Ramadan. Is a two hour reduction necessary? Is a mix of one hour reduction and one hour adjustment optimal (as practiced generally in Indonesia and Malaysia)? Do hour reductions generate the desired increase in spiritual connectivity, or do they have an adverse effect (e.g. laziness, apathy, etc.)? Should a segmented or other flexible approach be considered, for example, for certain types of hard labor? The study provides beneficial insight on how employers can support Muslim employees in honoring their religious requirements. This attention is expected to result in employee goodwill as well as productivity improvements. It is clear from survey responses that most Muslims fast, and those who fast do see an increased level of spiritual activity for which the respondents value employer flexibility. 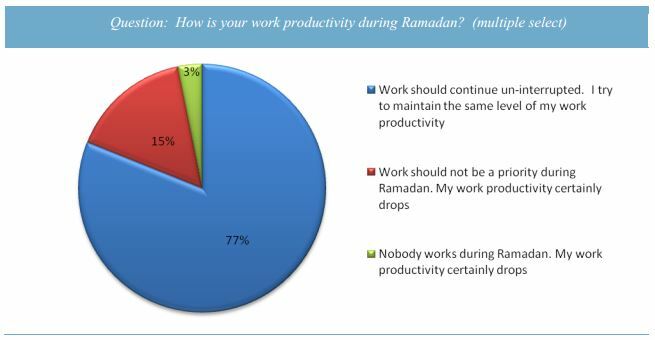 An important insight from this survey is that most survey respondents (77%) say they try to maintain same level of work productivity during Ramadan and feel that work should continue uninterrupted. Also, although there are no specific religious injunctions on reducing work hours, increased spiritual activity is to be expected and accommodated. Reduced or flexible scheduling is especially important for work that requires severe physical labor. Most OIC based employees (74%) said they were happy with their employers’ flexibility during Ramadan. At the same time, over 25% have higher expectations of their employers. Be aware of the activities Muslims are striving for to achieve spiritual excellence (e.g. reading the Qur’an regularly, praying at a mosque, giving extra in charity etc.). Perhaps special programs can be created to facilitate these efforts. While a majority (61%) of respondents from OIC countries said their company’s productivity does not suffer during Ramadan, a sizeable 26% said their company’s productivity unnecessarily suffers. This should be a cause for companies to evaluate their practices and policies. Contrasted with OIC based employees, non-OIC based employees were less happy with their employers’ flexibility during Ramadan (48% vs. 74%). Although commendable that a good percentage of Non-Muslim majority based companies do accommodate for Muslim needs, the gap does present HR departments within these companies’ opportunities to engage with their Muslim employees to impact not just goodwill but productivity. As mentioned earlier, most Muslims during Ramadan expect to be as productive as they would be at any other time. However, the survey results show that they engage in added spiritual activity which reduces physical energy. Any accommodation of this reality is expected to increase goodwill and productivity. A big percentage of non-OIC based respondents (49%) expressed desire for employees to set special Ramadan working hours. (Special hours may not necessarily mean reduction of hours but an adjustment—for example, providing an early start and an early end to the workday.) 25% of the respondents stated that their employers provide special working hours. 38% also expressed an interest in special prayer time or facility. Additional, but less prioritized requests include activities such as organizing Iftar and Eid gatherings. This report was authored by DinarStandard team: Rafi-uddin Shikoh, Maria Zain (Analysis), Deborah McNichol (Editor,) with input and suggestions from the ProductiveMuslim team: Mohammed Faris, Lotifa Begum, Ahlam Yassin, Saliha Celenlizade, as well as expert advice and input from the following advisors: Husain Quadri, and Farah Ghias. ProductiveMuslim team was also instrumental in distribution of the survey. DinarStandard™ specializes in the emerging Muslim markets — helping companies with their growth strategies. For more than 5 years, DinarStandard™ has been a pioneer in researching and highlighting the emergence of the Muslim Lifestyle Market globally. It has been delivering Muslim market analysis, feasibility studies and growth strategies for its clients. Its anchor report, the DS100–Top 100 Businesses of the Muslim World, and other original reports are regularly covered by global media such as The Economist, Forbes, Zaman (Turkey,) Malaysian Star and many others. ProductiveMuslim Ltd is a private UK company dedicated to promoting productivity amongst Muslims worldwide. Since its launch in June 2008, ProductiveMuslim Ltd launched three websites dedicated to its message of productivity for the Muslim market, these are: ProductiveMuslim.com, ProductiveRamadan.com, and LeadingProductiveLives.com. It delivers its message through daily articles, weekly videos, weekly e-mail newsletter, as well as seminars and workshops in various cities. It specializes in developing productivity resources for its audience including worksheets, animation videos, and interactive online courses for members. The contents of this report are based on a combination of quantitative and qualitative assessments of data. While every care has been taken in the preparation of this report, no responsibility is taken by ProductiveMuslim Ltd or DinarStandard as to the accuracy or completeness of the data used or consequent conclusions based on that data, due to the limited set of information provided by each institution. This report is protected by United States and international copyright law, and all rights are reserved. Copyrights in the contents and data of this report are jointly owned by ProductiveMuslim Ltd and DinarStandard unless otherwise indicated. The content and data found on this report may not be distributed, modified, transmitted, reused, or reposted for private, public or commercial purposes without the express written permission of both ProductiveMuslim Ltd and DinarStandard. Should you have any enquiries, please do not hesitate to contact Rafi-uddin Shikoh, tel: +1 347 624 7454, rafishikoh (@) dinarstandard.com, or Mohammed Faris, tel: +44 117 230 9442, mohammed (@) productivemuslim.com.